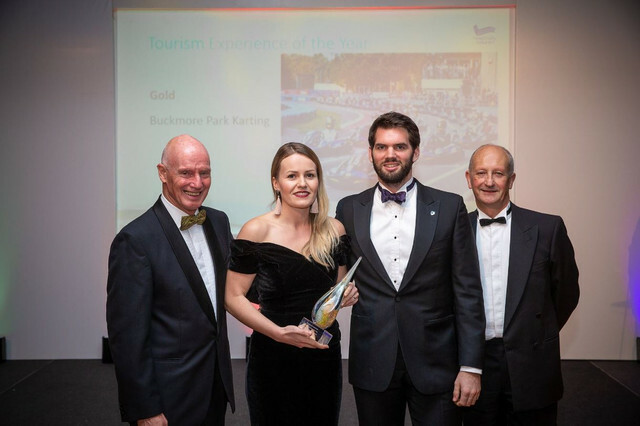 Buckmore Park Karting has won gold in the highly-coveted “Tourism Experience of The Year” category at the 2018 Beautiful South Tourism Awards. This year’s Beautiful South Tourism Awards were held at the Grand Hotel Brighton and saw TV and radio presenter of sports events, Mark Jones, celebrate with the cream of the South East’s tourism industry. 74 businesses and tourism professionals received Gold, Silver or Bronze trophies at what has become the industry’s year-end highlight. At the presentation, the judges revealed that Buckmore Parks entry was “a different level, amazing” and fitting of the gold award in its class. This accolade joins a growing list of achievements won by the circuit in recent times, which also includes year on year recognition from TripAdvisor through its “Certificate of Excellence” program and the industry impressive “Circuit Of The Year” award by Karting Magazine. Leonora Surtees, Managing Director of Buckmore Park Karting, accepted the award on the night, along with fellow Director Richard Martell. 1 Race, 3 Lap Records Smashed! WTF1 To Race In The BP24 Hour! Win A Free Karting Event! BP 24 Hour Race - Only 17 spaces left!